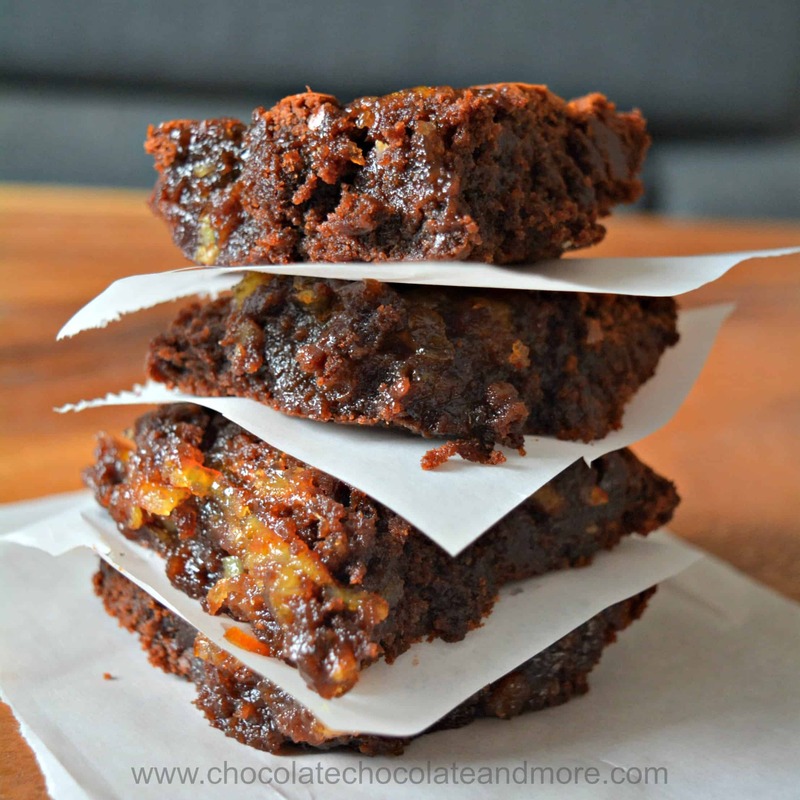 Orange Marmalade Brownies - Chocolate Chocolate and More! 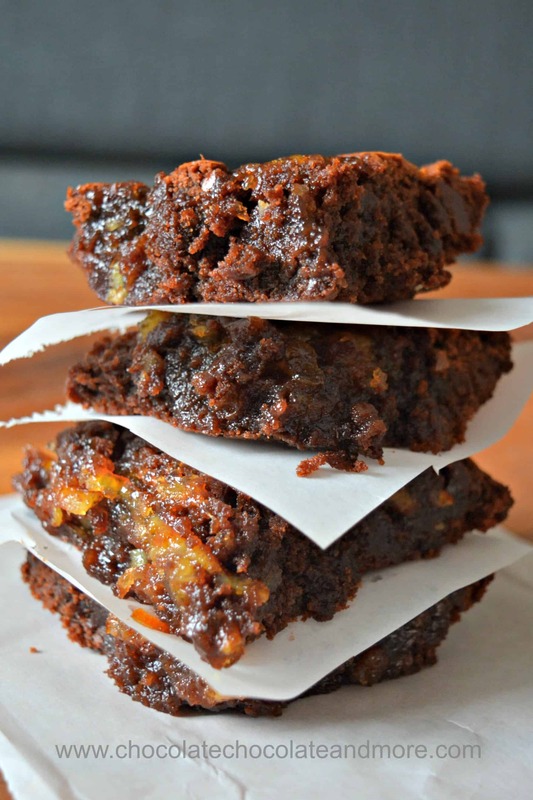 With just a few simple tweaks to your favorite brownie mix, you can have these amazing orange marmalade brownies in less than an hour. It’s that crazy time of year when parties abound and time is short. Two of my colleagues are going home to Korea soon so we had a going away party at work for them. I baked like a wild dog for Thanksgiving but I only had one slice of blackberry apple pie left to show for it. I needed something quick and memorable for them. A couple of months ago Jenni Field over at Pastry Chef Online had a bake along with Jamie Schler, the author of Orange Appeal: Savory and Sweet. They made several yummy dishes together but the dessert really caught my eye (go figure). It was a brownie recipe infused with orange and topped with some marmalade. 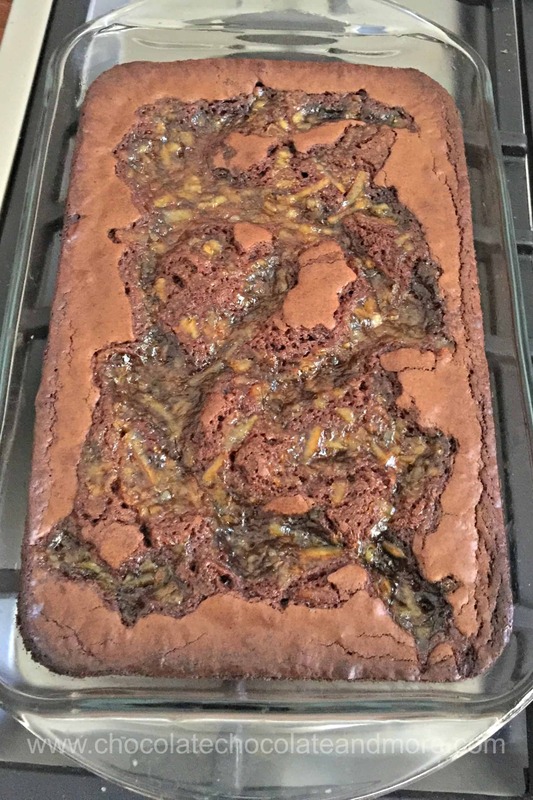 Jamie’s from-scratch recipe comes out as a deeply rich chocolate brownie marbled with orange marmalade. They had a contest for a free copy of the book. You had to bake a batch of the brownies and then take a photo to enter. I bought the marmalade and that’s as far as I got. So no cookbook for me. Now, I don’t like marmalade all that much so I hadn’t touched it. Time to make a simplified version of Jamie’s decadent orange marmalade brownies. These orange marmalade brownies only required two changes to the mix so I made them in less than an hour. Adding the orange marmalade before you bake lets it bake into the brownies and makes a chewy topping on top of your chewy brownies. I did have to bake the brownies an extra 10 minutes (more than the package directions). Grease a 9" x 13" baking pan and preheat oven to 350° F.
Mix brownie mix, eggs, Grand Marnier and cooking oil together until combined. Spread evenly in prepared pan. Spoon marmalade over the top of the brownies in a swirled pattern. *The brownie mix called for 2 eggs, 3 tablespoons water and 1/2 cup oil. If the brownie mix you use calls for different amounts of eggs and oil, use the ones on the box. Substitute orange juice or Grand Marnier for the water in the mix. Looking for more quick brownie ideas? Try these. I love this combo! These look amazing. Off to pin..